I’m hoping that incorporating goats into our pastures will help with weed control. Two of our horses are small enough to be companions for the goats. We also would like a 4 acre plot cleared, and goats can help with that too. Despite my husband’s eye rolling, building a methane digester is a big goal. I have to clean manure anyway, and I’m going to compost it anyway, so why not go the extra step and capture the methane? I’m not a 100% sure we will use it for more than cooking, since I plan to heat the barn with water. I’ve been reading about using ethanol for powering generators for off grid living, and that seems an easier route to go for electricity, and an adjustment to a generator we can easily do at home. We’ve started gathering supplies for the aquaponic system. I’ll start off with goldfish, but eventually I want to have blue gill, tilapia, and catfish, along with fresh water prawns. I’m not a fan of catfish but my husband is. I’d prefer to only do tilapia and prawns, but we, at least at this point, can’t breed the tilapia because we do have winter here, so I will just buy fingerlings every year until we can consistently keep the water warm enough. Most of these are heirloom varieties. I’ve shopped the non-gmo catalogues, such as Baker Creek, Seed Savers, etc. I haven’t ordered my tomato seed yet because I spent a while deciding on varieties. I’ve decided to focus on heirloom varieties specific to my region, and Baker Creek has quite a few. Last year’s tomatoes got a mosaic virus, so I’ll be planting in a different area. I bought the plants from a feed store, so I’ll be avoiding that too. The methane digester sounds like a great off-grid project, and keeping methane gas out of the environment is definitely beneficial for all of us. Looking forward to reading more posts on the topic. I love kohlrabi, but have only had marginal success growing it. Occasionally, a plant will not develop the bulb at all. Hopefully you have better luck! I’ll definitely be posting about the digester. 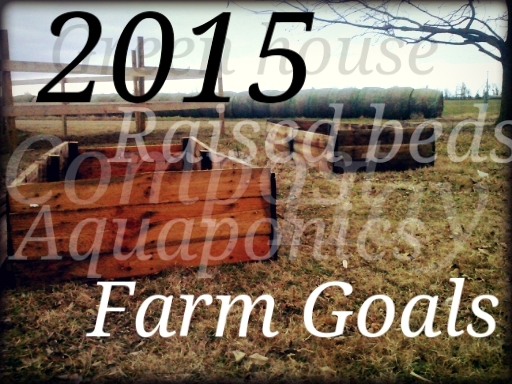 With 7 horses and a garden to compost for, it’s a project dear to my heart! My dad has wanted to build one of those my whole life. My mom argued with him for years. He had tons of uses for the gas but I can not recall them now. I know he wanted to use it for heating and cooking, but I think He had ideas of running everything off one. I had forgotten about it, until reading this. I am gonna have to ask him now. I’d love to hear his ideas! Originally I wanted to power a generator with it, but I’m learning it’s more of an adjustment than converting a generator for ethanol. Ethanol has advantages too because you can feed left over mash to pigs, but you need to register with the government before you produce it. I’d love to power the property with the horses but it’s beyond my current knowledge. 🙂 maybe one day.